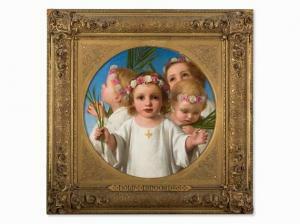 Find artworks, auction results, sale prices and pictures of William Charles Thomas Dobson at auctions worldwide. with Agnew & Sons, London. Manchester, 'Exhibition of Art Treasures', 1857. Manchester, 'Royal Jubilee Exhibition', 1887. William Charles Thomas Dobson was born in Hamburg, Germany, but shortly after his birth his parents moved to Great Britain. As a young man, Dobson practiced drawing during his visits to the British Museum and he was enrolled in the Royal Academy Schools in 1836. He exhibited regularly at the Royal Academy from 1842 and he was noted for his portrayal of uplifting themes and brilliant colors reminiscent of the work of Sir Charles Eastlake. Dobson was elected ARA in 1860 and RA in 1872. The Bible passage referred to in the painting is Job, 42:12-15 when God rewards Job after all his tribulations. "So the Lord blessed the latter end of Job more than his beginning.." Job is depicted at the center of the composition lifting his hands in thanks to the Lord and is surrounded by his generations. was offered at Bonhams, London, 9 March 2004, lot 72. 13 x 9.7cm (5 1/8 x 3 13/16in). PROVENANCE: with Agnew & Sons, London. EXHIBITED: Manchester, 'Exhibition of Art Treasures', 1857; Manchester, 'Royal Jubilee Exhibition', 1887. William Charles Thomas Dobson was born in Hamburg, Germany, butshortly after his birth his parents moved to Great Britain. As ayoung man, Dobson practiced drawing during his visits to theBritish Museum and he was enrolled in the Royal Academy Schools in1836. He exhibited regularly at the Royal Academy from 1842 and hewas noted for his portrayal of uplifting themes and brilliantcolors reminiscent of the work of Sir Charles Eastlake. Dobson waselected ARA in 1860 and RA in 1872. Dobson was the first headmaster of the Birmingham School forDesign, but held that post for only two years, at which time hedecided that he needed to travel to Germany and Italy to furtherdevelop his art. He returned to England after a year abroad anddedicated himself to painting. The Bible passage referred to in the painting is Job, 42:12-15 whenGod rewards Job after all his tribulations. 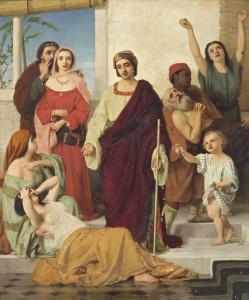 "So the Lord blessedthe latter end of Job more than his beginning.." Job is depicted atthe center of the composition lifting his hands in thanks to theLord and is surrounded by his generations. 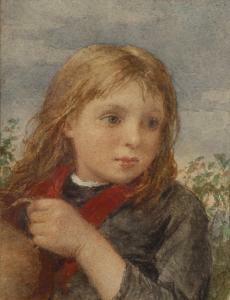 A watercolor study for The Prosperous Days of Job, wasoffered at Bonhams, London, 9 March 2004, lot 72. Eastlake. Dobson was elected ARA in 1860 and RA in 1872.